I bought this book by accident. How does one buy a book by accident? you ask. Well, I bought the eighth book, Written in my Heart’s Own Blood, not realizing it was the eighth book in a series. Then I decided since Outlander is insanely popular, I thought I’d give it a shot, and I’m glad I did. This book on a whole was quite good. 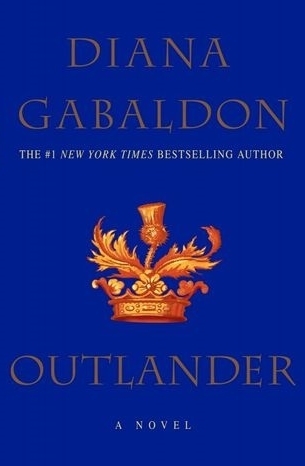 Gabaldon does an excellent job of taking the reader into the Scottish highlands, particularly by use of accents in the novel. Normally I don’t go for novels that are set in a more historical time period, but this one I found quite intriguing. I found it a little slow in the beginning though, mainly because I was waiting for Claire (the main character) to time travel. I was like, yes, okay, her husband likes learning about his ancestors, but when does she time travel!?!? It was kind of necessary though to set up the story. This is not a novel that rushes, but one that takes its time and brings the reader into the world of Claire Beauchamp. Claire was quite an intriguing character in herself. I like how she grew throughout the novel and her varied background. How she’s always wavering between her time and the time she is presently in, but manages to insert herself into society, even if she does garner a few sceptical glances. Many times I wasn’t sure which way she was going to go, or which way the story was going to pull her. Which I liked. The story wasn’t spelled out for the reader, but there were multiple ways in which it could have gone. Jamie is the other, or second main character, who I quite liked as well. He has a variety of funny and embarrassing stories that come out about his youth. He’s also kind of funny in himself. He does things that are gentlemanly for Claire, but then there are aspects of his character that are rather primitive, as he is from the 1700s. But part of his primitive aspect is what makes him so charming. They just don’t make men like Jamie anymore. For those who are interested I would recommend it to people who like romance set in an earlier time period, or are merely intrigued by the hype around this book. Which I do think the hype is justified, otherwise it wouldn’t be there, but perhaps you’ll have a different opinion.